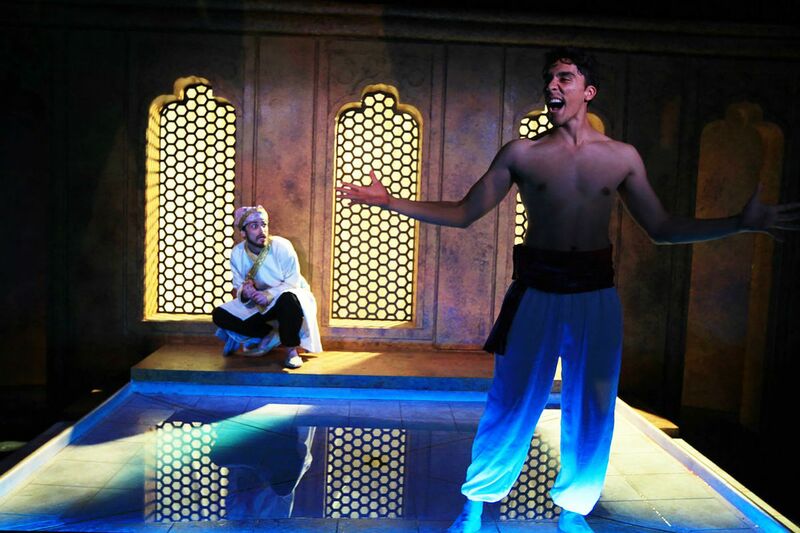 From left: Anthony Mustafa Adair (Humayun) and Jenson Titus Lavallee (Babur) in Theatre Exile’s "Guards at the Taj" by Rajiv Joseph. In Endymion, John Keats contended that "a thing of beauty is a joy forever." Yet, what if a thing of beauty becomes a source of unreasoning despotism, and a challenge to our notions of goodness and the well-lived life? Such an inquiry inspires the titular individuals in Guards at the Taj to ponder their allegiance to authority, tradition, and each other. Celebrating its 20th anniversary season, Theatre Exile is offering the Philadelphia premiere of Rajiv Joseph's award-winning play at its South Philadelphia Studio X space. Known for tackling provocative texts, the company, which recently received five Barrymore Awards, might well win more awards next year, thanks to this emotional production. Set in 1648, the play depicts imperial hires Humayun and Babur, whose latest lackluster (at least on the surface) task calls for them to stand with their backs to the Taj Mahal, Shah Jahan's tribute to his deceased bride. It will be unveiled at dawn. Like a 17th-century version of Lot, Humayun vows to respect orders, but the levity-seeking Babur has no such reverence and peers at the monument at sun-up. His longtime friend soon joins him. Humayun and Babur are portrayed beautifully and often heart-wrenchingly by Anthony Mustafa Adair and Jenson Titus Lavallee, respectively. The lives of these two hirelings become studies of the possibilities of joy in a world that does not afford them much of it. Babur is a dreamer who dreads succumbing to Humayun's strict adherence to rules. An order from their sovereign, however, forces him to comply, and the results lead to a simultaneously comedic and pathetic second scene in which he and Humayun witness the carnage created by an unthinkably cruel order from the shah, issued solely out of vanity, to punish the monument's 20,000 builders. "I killed beauty," Babur bellows as the two clean up after the shah's heartlessness. Uptight in the early stages, Humayun becomes an interesting case. He never truly separates the professional from the personal. The man simply cannot consider the thrill of throwing caution to the wind. With sure guidance from director Deborah Block, Adair and Lavallee contemplate the consequences of sacrificing integrity just to save their necks. For his part, Babur will never be happy as long as he obeys an authority he doesn't respect. He proposes that they kill the shah - and now loyalty to friend threatens to clash with loyalty to sovereign. We can't blame Humayun for hesitating. He can see Babur's plot is an act of principle, but he is also frightened at the danger. He even blasts his fellow guard for being weak. When Babur lands in prison, he says, "I like being weak" - standing up for the healthy, undermining power of idealism, humor, and suspicion of authority. Early in the opening scene, Babur, never content with his routine life, says, "I think God wants us to learn more and more things." Here's hoping that Theatre Exile produces more and more things like Guards at the Taj, a compelling call for loyalty in human life.